The 2018 NOTA Conference was a success this year! The Conference was held in Omaha at the Nebraska Methodist College Friday, March 23rd and Saturday, March 24th, 2018. The annual conference is just one of the many ways that NOTA strives to ensure your membership continues to be valuable to you both personally and professionally! We had 92 occupational therapists, occupational therapy assistants and students participate in the conference in addition to the many volunteers, 7 vendors, 7 sponsors, and 20 poster presenters. We also took the opportunity to showcase 10 international experiences by Nebraska OT’s as a way to recognize practitioners who have made an impact on a global scale. Conference kicked off with a Pre-Conference Institute: Perspectives on Healthcare Policy & Practice with representatives from AOTA, NOTAPAC, Nebraska RA and Lobbyist, as well as Program Directors from Creighton, College of Saint Mary, Central Community College, Nebraska Methodist College, and Union College. Friday evening a NOTA Friends reception provided a great opportunity for networking and conversation as well as visiting with vendors. NOTA Award winners were recognized and honored. Jean Peck, OTL, CHT was named Practitioner of the Year, Melissa Kimmerling EdD, MOT, OTR/L was named Contributor of the Year, and Sam Troia was named Occupational Therapy Student of the Year. The evening capped off with a powerful keynote “How to be your best at being an OT” by Brittany (Bennett) Stryker, OTD, OTR/L, BOCO sponsored by the Creighton Alumni Association. Saturday held another day full of activity and energy! The morning kicked off with a special networking breakfast and the opportunity to speak with our NOTA lobbyist Cheryl Frickel, OTD, OTR/L and Nebraska RA Melissa Kimmerling EdD, MOT, OTR/L. Three tracks were offered in the morning and afternoon sessions. The morning tracks available were “GoBabyGo: Roles, Research, & Application”, “Review of Orthotic Fabrication ”, and “Trauma Informed Care and Occupational Therapy Practice”. Afternoon tracks available were “Establishing Best Practices in Teletherapy”, “Using Errorless Learning in Rehabilitation,” and “Designing Accessible and Therapeutic Environments for All Ages”. Afternoon networking with vendors and poster presentations as well as door prizes made for a full day! Thank you to our Gold Sponsor Mobility Motoring! Thank you to our Bronze Sponsor Innovative Prosthetics & Orthotics, and Friend Sponsors Ensign Services, Snyder Charleson Therapy Services, Restorative Therapies, Inc., Union College, and Total Respiratory & Rehab. NOTA Conference also hosted the following vendors: Neofect USA, Envision University, Cariant Health Partners, Mobilis Home Medical Equipment, RehabVisions, Select Rehabilitation LLC, and Frontier Home Medical. Friday night’s “mocktail” hour and Saturday’s breakfast and lunch were provided by A Catered Affair. Thank you to our conference planning committee for a successful weekend. The committee consisted of Michelle Massey, MS, OTR/L , Mary Turner, M.Ed., OTR/L, Anna Domina, OTD, OTR/L, Emily Barr, OTD, OTR/L, BCG, Whitney Rubin, OTD, OTR/L, and Tara Ruppert, OTD, OTR/L, along with vendor coordinator Nicole Brown, MOT, OTR/L. Check the notaonline.org website for the 2019 NOTA Conference dates which will be announced shortly! We hope you will join us! The 2017 NOTA Conference was a great success! The Conference was held in Omaha at Creighton University on Friday, February 24th and Saturday, February 25th, 2017. The annual conference is just one of the many ways that NOTA strives to ensure your membership continues to be valuable to you both personally and professionally! We had 111 occupational therapists, occupational therapy assistants and students participate in the conference in addition to the many volunteers, 13 vendors, 4 sponsors, and 10 poster presenters. We were excited to have such great attendance! Students had a special opportunity to have a pre-conference session with Amy Lamb, OTD, OT/L, FAOTA and snacks sponsored by Nebraska Methodist College. Conference then kicked off with a Pre-Conference “Parenting with Physical Impairments”. A panel of parents with disabilities shared their personal stories, and providers shared strategies and resources for healthcare professionals. Friday evening a NOTA Friends reception provided a great opportunity for networking and conversation as well as visiting with vendors. The evening capped off with a powerful keynote “OT Soaring into the Future” by Amy Lamb, OTD, OT/L, FAOTA, and President of the American Occupational Therapy Association, Associate Professor of Occupational Therapy at Eastern Michigan University, and owner of AJLamb Consulting. Saturday held another day full of activity and energy! The morning kicked off with a special breakfast opportunity to speak with our NOTA lobbyist Cheryl Frickel, OTD, OTR/L and RA Dr. Melissa Kimmerling EdD, MOT, OTR/L . Three tracks were offered in the morning and afternoon sessions. The morning tracks available were “Expanding Occupational Therapy by using Telehealth”, “Outpatient Interdisciplinary Approach to Feeding, Eating, and Swallowing in the Complex Pediatric Patient ”, and “Therapeutic Exercise Prescription”. Afternoon tracks available were: “Integrating Themes of Hope and Evidence-based Practice in Alzheimer's Care ”, “Mindfulness & Zentangle: Science, Health & Happiness....even when you think you don't have time!”, and “What Does it Take For a Woman to Regain Her Independence? It Takes Occupational Therapy: A Look at Women's Health and Occupational Therapy ”. Afternoon networking with vendors and poster presentations as well as NOTA Award and door prize presentations made for a full day! We also honored several individuals. Lauren Robins OTD, OTR/L, CLT was named Practitioner of the Year, Janel Meis, OTD, OTR/L was named Contributor of the Year, and Brady Moran was named Occupational Therapy student of the Year. We want to say thank you to our Gold Sponsor Mobility Motoring, and our Friend Sponsors Coloplast, Nebraska Methodist College, and Ensign Services. NOTA Conference also hosted the following vendors: Bioness, Cariant Health Partners, Central Community College, CHI Health, Children’s Home Healthcare– Children’s Hospital & Medical Center, Kohll’s Pharmacy & Homecare, Madonna Rehabilitation Hospital, Midwest Respiratory & Rehab, Nebraska Extension-AgrAbility, RehabVisions, Reliant Rehabilitation, Select Rehabilitation, Inc., and United Cerebral Palsy of Nebraska. Friday night’s cocktail hour was sponsored by Mobility Motoring, and food for the weekend was provided by Creighton University– Sodexo. Check the notaonline.org website for the 2018 NOTA Conference dates which will be announced shortly! We hope you will join us! The 2016 NOTA Conference was a wild success this year! 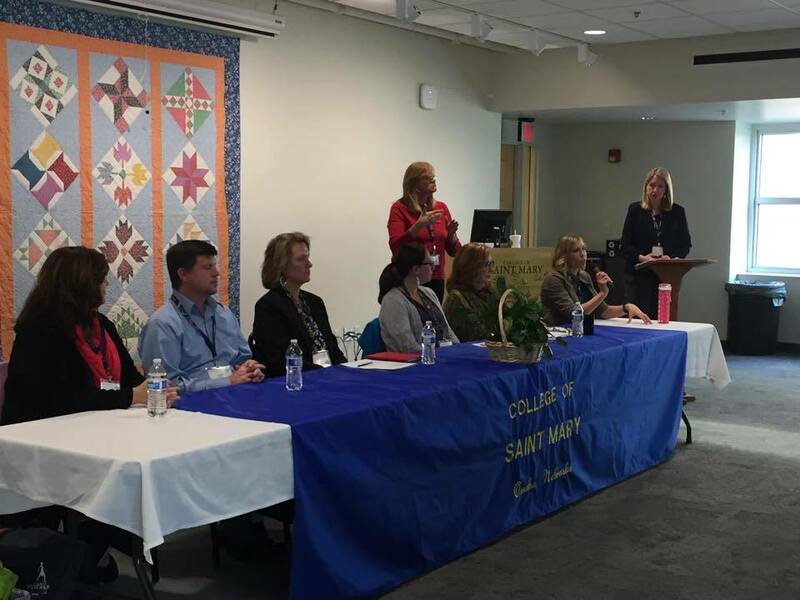 The Conference was held in Omaha at the College of Saint Mary, Friday, March 18th and Saturday, March 19th, 2016. The annual conference is just one of the many ways that NOTA strives to ensure your membership continues to be valuable to you both personally and professionally! A record number, 119 occupational therapists, occupational therapy assistants and students participated in the conference in addition to the many volunteers, 14 vendors, 8 sponsors, and 21 poster presenters. This is exponential growth from the 2014 spring conference! Conference kicked off with a Pre-Conference Town Hall Meeting: “Vision, Progress, and Issues Facing Occupational Therapy in Nebraska”. Friday evening a NOTA Friends reception provided a great opportunity for networking and conversation as well as visiting with vendors and poster presenters. The evening capped off with a powerful keynote “All Hands Make the Future” by Christina Metzler, AOTA’s Chief Public Affairs Officer. Saturday held another day full of activity and energy! The morning kicked off with a special breakfast opportunity to speak with our NOTA lobbyist Dr. Steve Bowen. Three tracks were offered in the morning and afternoon sessions. The morning tracks available were “Vision Rehabilitation after TBI or CVA”, The Power of the Interactive Metronome in Outpatient Pediatric Therapy”, and “Lymphedema and Cancer Rehabilitation: Closing the Gap in Patient Care”. Afternoon tracks available were: “Rural Health OT: Bringing Our Services to Rural Nebraska”, “Handwriting! It’s A Big Deal,” “Everyday Ergonomics: Integrating Ergonomics into Your Practice for Yourself, Your Clients and Your Organization” and “On Pins and Needles: OT Interventions for Neuropathic Conditions of the Upper Extremity, Including Orthosis Fabrication and Manual Treatment”. Afternoon networking with vendors and poster presentations as well as NOTA Award and door prize presentations made for a full day! We also honored several individuals. Courtney Kossow, OTR/L was named Practitioner of the Year, Melissa Kimmerling, EdD, MS, OTR/L, was named Contributor of the Year, and Kelly Roth, was named Occupational Therapy student of the Year. Thank you to our Gold Sponsors, College of Saint Mary, Creighton University, and Mobility Motoring! Thank you Silver Sponsor Nebraska Methodist College, and Friend Sponsors Aegis Therapies, Coloplast, and Ensign Services. NOTA Conference also hosted the following vendors: Cariant Health Partners, CHI Health,Custom Medical Solutions, ENCORE! Rehabilitation Services, Hanger Clinic, Madonna Rehabilitation Hospital,Mobilis Home Medical Equipment, Nebraska AgrAbility, Ride Designs, RehabVisions, Select Rehabilitation,The Shape Right System, LLC, Total Respiratory and Rehab, and University of St. Augustine for Health Sciences. Friday night’s cocktail hour and Saturday’s breakfast and lunch were provided by College of Saint Mary Chartwell’s Catering. Check the notaonline.org website for the 2017 NOTA Conference dates which will be announced shortly! We hope you will join us! 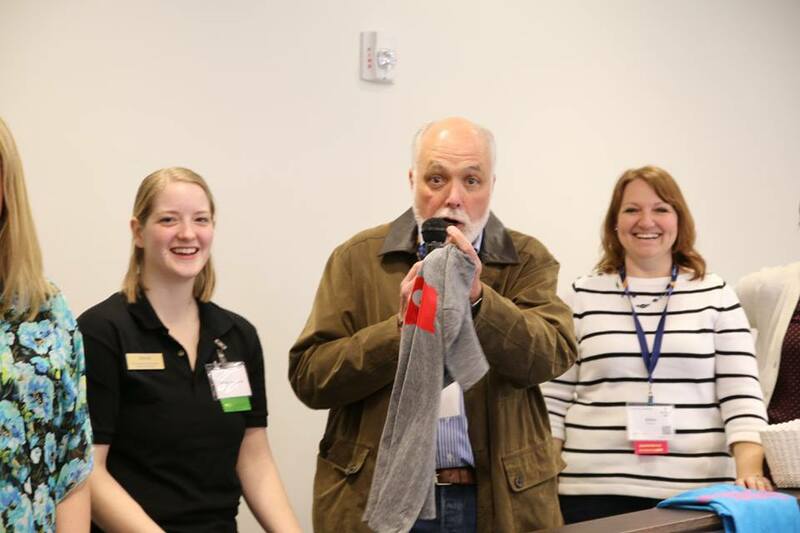 The 2015 NOTA Conference was a wild success this year! The Conference was held in Omaha at Immanuel Hospital Conference Center Friday, March 20th and Saturday, March 21st, 2015. Seventy four occupational therapists, occupational therapy assistants and students participated in the conference in addition to the many volunteers, 15 vendors and 24 poster presenters. This is exponential growth from the 2014 spring conference! Conference kicked off with the Pre-Conference Institute “Defining Entry-Level Practice: Guidance for Fieldwork Educators” by visiting New York therapists Virginia Crippen MSA, OTR/L and Tara Collins MHS, OTR/L. 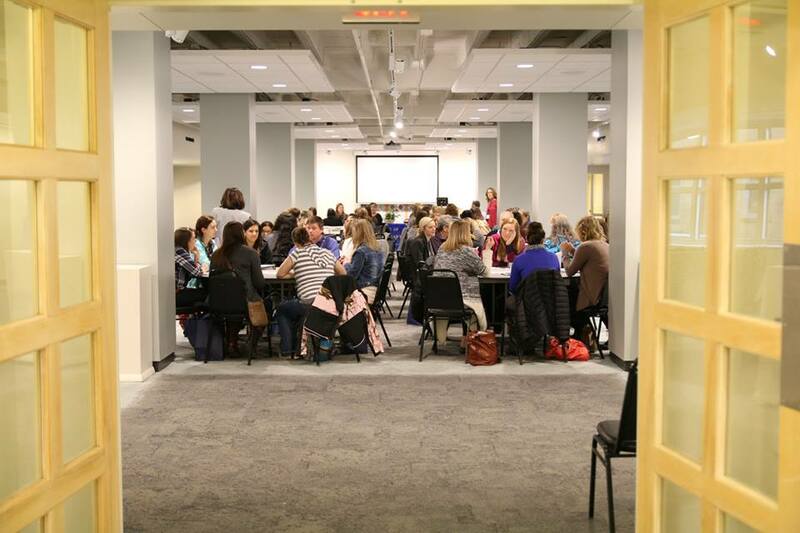 Participants learned key factors to consider when determining a student’s entry-level practice competency and strategies for obtaining competence and facilitating student performance. Friday night we were honored to hear first hand Maggi Pivovar, OTR/L and Creighton University 1993 alumnae, share her personal story about her battle for life following the contraction of meningitis, and her resulting bilateral below-the-knee amputations during “An Abundant Life: Thriving and Flourishing Through Unforseen Activity.” Through her speech, attendees were able to hear how her training as an occupational therapist impacted her recovery. We also had the opportunity to personally reflect and reaffirm our profession’s commitment to holistic care. Also on Friday, we engaged in positive networking and educational opportunities through the alumnae and friends reception, poster presentations, and discussion with sponsors and vendors. We honored several individuals Saturday for their contribution to occupational therapy in the state of Nebraska. These include Occupational Therapy Practitioner of the Year, Kylie Widhelm, OTD, OTR/L, whose nomination indicated, “Kylie serves as a lab instructor for the last 2 years at Creighton. She also serves as a fieldwork educator at Bergan Mercy Hospital. Students and faculty alike have been most impressed with Kylie's ability to articulate the value of what occupational therapists do, demonstrate care for the clients she serves, and provide excellent mentorship and student supervision. Kylie is an asset to the profession and especially to the clinical education of occupational therapy students!” Cheryl Frickel, Creighton University occupational therapy student, was awarded Outstanding Occupational Therapy Student. Cheryl’s nomination was outstanding, indicating “Cheryl is a true leader in the field of OT and I feel privileged to learn beside and from her as a peer. Throughout our last two and a half years in the program, Cheryl has reached out to numerous community service activities, many offered through Creighton organizations. However, unlike most students she has extended herself to personally find additional community activities, outside of Creighton organizations, she is passionate about and can contribute to. Then she goes a step further and invites peers to contribute to the cause.” NOTAs president, Anna Domina, OTD, OTR/L, was awarded the Outstanding NOTA Member. “Anna has done an excellent job as the NOTA President. It should be noted that Anna stepped in when no one else was able/willing to and she stayed on as President for additional time for the good of the organization!” Congratulations to this year’s recipients! Saturday held another day full of activity and energy! The morning kicked off with a special breakfast opportunity to speak with our NOTA lobbyist Dr. Steve Bowen. Three tracks were offered in the morning and afternoon sessions. The morning tracks available were “Caregiver Wellness: Cultivate, Grow and Thrive” by Dr. Eboni Green in which participants were able to assess their level of burnout, discuss how to avoid burnout, how to overcome and reverse the effects of burnouts, and how to integrate practical solutions into our daily lives as therapists. In “It’s All About the Tablet: Using Technology to Return to Functional Living” by Jennifer Brauer, OTD, OTR/L, Kiley Nelson, MOT, OTR/L, Krystal Winter, MS, CCC-SLP, and Ann Benson, MS, CCC-SLP, participants engaged in a hands-on session in which they learned about identifying, locating, and using apps with the adult population. The children and youth practice attendees had the opportunity to attend “A Sensory Integrative Approach for Feeding Challenges” by Stephanie Adam, OTD, OTR/L, Candice Mullendore, MOT, OTR/L, and Kristi Pilakowski, OTD, OTR/L in which they learned more about the dynamic process of eating, the difference between picky eaters and problem feeders, the Sequential Oral Sensory Approach to Feeding, and strategies to integrate into mealtimes to improve success and decrease anxiety. The afternoon tracks available were: “A Beginner’s Guide to Living with Meaning and Flow as an OT/OTA” by Monika Lucaseiwicz, MOT, OTR/L and Stephanie Bell, MA. Participants learned fun, effective ways to incorporate wellness into their daily lives to improve their health and overall ‘flow’. Stacy Reichmuth, OTR/L presented on “Treatment of the Hemiplegic Upper Extremity Across the Continuum” in which she shared her experiences and education on the effective treatment of the upper extremity no matter which setting a practitioner is in. The team from Pediatric Therapy Center presented again in the afternoon, this time on “Sensory Processing and Functional Performance”. Participants expanded their knowledge on sensory processing disorder, sensory versus behavior, and the use of sensory strategies. Afternoon networking with vendors and poster presentations as well as NOTA Award and door prize presentations made for a full day! Thank you to our Gold Sponsor, Mobility Motoring! Thank you to our university sponsors Creighton University and Central Community College. Thank you Friend Sponsors Total Respiratory and Rehab, Ensign Services, Snyder Charleson Therapy Services, and Kubat Pharmacy. NOTA Conference also hosted the following vendors: Easter Seals, Coloplast Continence Care, OrthoMedics, RehabVisions, CUSOTA, NOTAPAC, Aegis Therapies, CHI Health, Mobilis Home Medical Equipment, Select Rehabilitiaon, and NuMotion. Friday night’s cocktail hour and Saturday’s breakfast and lunch were provided by Wheatfield’s Catering. Thank you to all that made the 2015 NOTA Conference such a success! We hope you will join us for the 2016 NOTA Conference. Dates will be announced very soon. Visit notaonline.org for updates, and of course we will send out Save the Date reminders via email. The 2014 NOTA Conference was held in Omaha, NE at Immanuel Hospital Conference Center Friday, April 25th and Saturday, April 26th, 2014. Occupational therapists participated in the conference in addition to the many volunteers and 15 poster presenters. Conference kicked off with 2 Pre-Conference Institutes: Acute Care to Community Re-entry: Enhancing Stroke Rehabilitation across Nebraska presented by Lou Jensen, OTD, OTR/L, Teresa Cochran, PT, DPT, & Kathleen Volkman, PT, MS and the second titled Return to Work Part of Recovery presented by Virginia Schweitzer COTA/L. 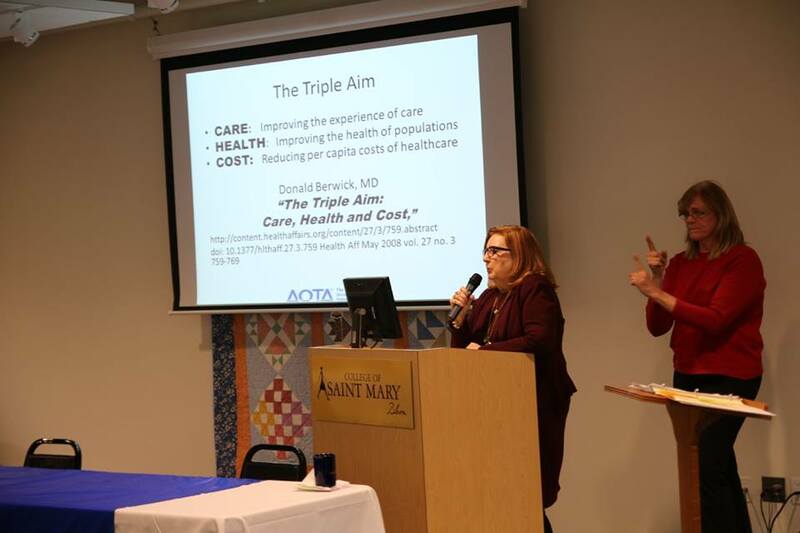 Friday night we became acutely aware of “Quality, Efficiency, and the Affordable Care Act” via a keynote address provided by Dr. Amy Lamb, Vice President of AOTA and Mr. Chris Lee, PT of Madonna Rehabilitation Hospital. Saturday we had a variety of speakers who provided expertise on Occupational Therapy in the oncology setting, managing bowel and bladder incontinence, and the Ready Approach. Thank you to Lauren Robins, OTD, OTR/L, CLT, Cali Carlson PT, DPT, Courtney Kossow OTD, OTR/L, C/ NDT, Lindsay Tuxhorn, OTD, OTR/L, and Theresa Parish, OTR/L, CEES, Ready Associate for presenting at conference this year. We also honored several individuals. Diane Ulmer, OTR/L was name Practitioner of the Year, Brooke Murtaugh OTD, OTR/L, CBIS was named Contributor of the Year, and Justine Bucy was named Occupational Therapy student of the Year. Thank you to our Gold Sponsor, Mobility Motoring! And thank you to our Friend Sponsors Total Respiratory and Rehab and Creighton University. NOTA Conference also hosted the following vendors: Snyder Charleson Therapy Services, P.C., Numotion, and Select Rehabilitation Inc. We received such positive feedback about the venue that we will again hold the 2015 NOTA Conference at Immanuel Hospital’s Conference Center. Mark your calendars now for the 2015 NOTA Conference on Friday, March 20th and Saturday, March 21st, 2015! We hope you will join us! The 2012 NOTA Conference was held in Omaha in October. The conference was a success with positive feedback regarding our Friday and Saturday sessions as well as our keynote speaker. Friday began with educational opportunities regarding low vision rehabilitation from Evy Katz, OTR/L. The afternoon continued with our keynote speaker. Gina Giaffoglione gave a powerful keynote on her experience with spinal cord injury and how occupational therapy played an integral role in her rehabilitation journey. Saturday commenced with 3 full-day, breakout sessions. Pediatric rehabilitation, spasticity management, and myofascial release were the focus of the continuing education courses. 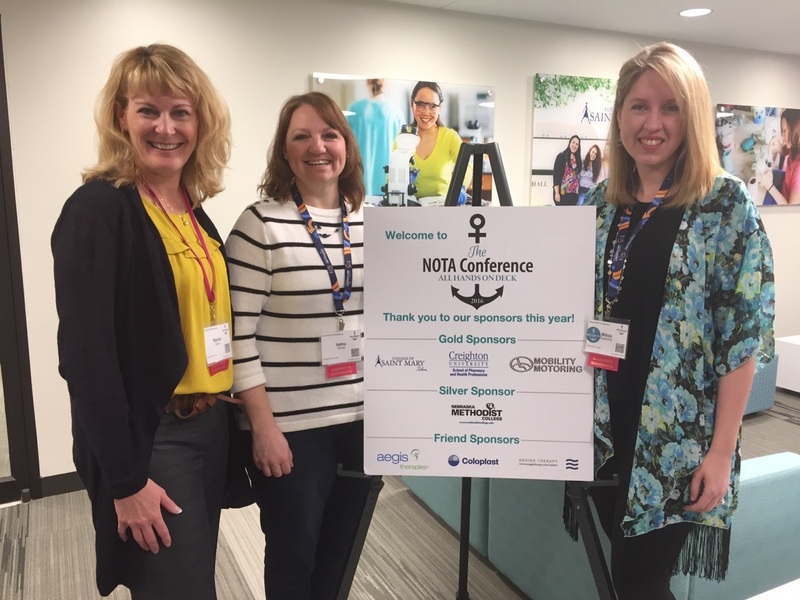 NOTA would like to again extend a huge thank you to Holly Schifsky, OTR/L, Lynn Dolezal, OTR/L and Jan Kelly, OTR/L, LMT for providing their expertise as our presenters this year. The conference was a success, although attendance was down as compared to past years. Thus the NOTA board is contemplating making some changes to future NOTA conferences. We asked for feedback from NOTA members and non-members regarding thoughts on future conferences. Taking action, in response to the feedback that was received, conference will move to the spring from fall in 2014. Mark your calendars for April 2014 for NOTA conference. To facilitate the transition from fall to spring, NOTA will be planning a one day “mini-conference” in fall of 2013 in western Nebraska to reach those practitioners in District 3. The NOTA board and Conference Committee will also be planning additional activities within the 2014 conference to facilitate continued networking, fundraising and just plain fun during NOTA conference. Please continue to provide your feedback as NOTA members on what you would like conference to include to meet your professional needs. Your feedback and suggestions are always welcome. Click here for the full 2012 conference brochure. Click here for the full 2011 conference brochure. Thank you!